16-bit PC/104 form factor (mechanical/electrically compatible) microcontroller. 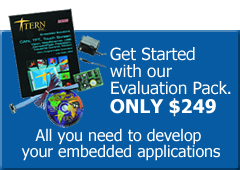 It is designed for embedded applications that require compactness, low power consumption, and high reliability. Measuring 3.8 by 3.6 by 0.5 inches, the A104™ offers a complete C/C++ programmable computer system with a high performance CPU (188) and operates at 40 MHz. 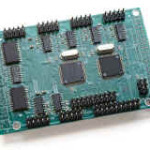 The A104 is a 16-bit PC/104 form factor (mechanical/electrically compatible) microcontroller. It is designed for embedded applications that require compactness, low power consumption, and high reliability. Measuring 3.8 by 3.6 by 0.5 inches, the A104 offers a complete C/C++ programmable computer system with a high performance CPU (188) and operates at 40 MHz system clock speed with zero-wait-state. It features up to 512KB ROM/Flash, 512KB battery-backed SRAM, 512 bytes serial EE, a real-time clock, three 16-bit timers/counters and a watchdog timer. Two DMA-driven serial ports and a third SCC2691 UART support reliable serial communication up to 115,200 baud. On-board drivers support three RS-232 ports, or two RS-232 and one RS-485 port, supporting either normal 8-bit or 9-bit multi-drop RS485/422 network with twisted-pair wiring. There are three 16-bit programmable timers/counters and a watchdog timer. Two timers can be used to count or time external events up to 10 MHz. They can also be used to generate non-repetitive or variable-duty-cycle waveforms as PWM outputs. The Pulse Width Demodulation (PWD), a distinctive feature, can be used to measure the width of a signal in both its high and low phases. This has potential in a variety of applications, such as bar-code reading. The 32 I/O pins on the Am188ES are multifunctional and user-programmable. You may have 15 or more lines free to use, depending on your application. Also on-board is a PPI (82C55) chip providing an additional 24 bi-directional I/O lines that can be used to interface to an LCD and a keypad. An adjustable negative voltage (-10V) is on board for LCD contrast. A 64 pin 8-bit PC/104 connector can be installed. The A104 is not fully PC/104 compatible; bus signals are routed to the connector directly from the CPU with no buffering. No software support is provided for direct interface to other PC/104 products. The 12-bit ADC has sample and hold, a high-impedance reference input, 11 single-ended 0-5V (or 0 to REF) inputs, and a 10 kHz sample rate. A 24-bit Sigma-Delta ADC (AD7731, Analog Devices) can also be installed. It has five inputs with programmable gain front end, which allows it to accept a range of low level transducer signals. At 800 Hz-output rate, the achievable resolution is 16-bit, based on the AD7731 datasheet. Two 12-bit DAC provides 0-4.095V analog voltages outputs capable of sinking or sourcing 5 mA. The 14 solenoid drivers are capable of sinking 350 mA at 50V, perfect for driving solenoid coils or power relays. The A104 provides its own voltage regulator and RS232/RS485 drivers. The A104-S supports six RS-232 and one RS-485 serial ports, including two optional SCC2692s. It offers 80+ I/Os. It does not support the 24-bit ADC, solenoid drivers, and one of the DAC chips. If you’re looking at the A104-S primarily for its serial-port capabilities, also take a look at the UART-8 serial port expansion controller. It provides 8 additional RS-232 ports, and can be easily interfaced with most TERN controllers. 14 solenoid drivers or protected HV input.